Alright, this review was actually due to be posted last week but weather, the post, and a mini plague all determined that this week was a much better fit ;) Thankfully, I can wholeheartedly say that The Lacemaker is worth the wait. 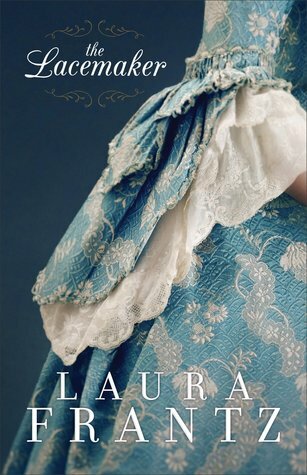 Laura excels at drawing reading in through her plot, a point well supported by The Lacemaker. I was on the edge of my seat as Frantz brought forth the bustling, tension-filled streets of the just barely English colonies and the loyalties which were rapidly changing. Her peaceful painting of Ty Mawr proved an ample setting for character growth, sweet romance, and the inclusion of faith so inherent to the previous novels I've encountered by Frantz. As far as characters go, I do feel the character development is far more rushed than the typical novels I tend toward. The relationships connected to both Liberty and Noble offered so much material that it would have been impossible to do everything justice. That said, I still felt as though few relationships were explored truly outside the main duo and even that left me wanting more. Frantz's true strength is in her stories. While I am under educated on the politics that led to the war for independence and cannot vouch for accuracy, I was thoroughly impressed by Frantz's ability to infuse her words with the emotions, urgency, and tensions that I can only imagine were present in that time of change. Frantz has the ability to make you feel the story and that alone is worth the read. The romantic aspect of the story was also very sweet to read. I appreciated the theme of redemption that seemed to follow Liberty throughout her romantic endeavors. Again, this is an area of the story which reaps the rewards of Frantz's skill in incorporating feeling into her narrative as readers can join with Liberty and Noble through the loss, fear, and sweet discoveries of love. Overall, I will recommend this novel and look forward to what Frantz has planned next. 4 out of 5 stars. "Book has been provided courtesy of Revell and Baker Publishing Group."